The words used in this article (Jewish) does not pertain to the serpent seed, but to the tribe of Judah. In November of 1860, David Wyrick of Newark, Ohio found an inscribed stone in a burial mound about 10 miles south of Newark. The stone is inscribed on all sides with a condensed version of the Ten Commandments or Decalogue, in a peculiar form of post-Exilic square Hebrew letters. The robed and bearded figure on the front is identified as Moses in letters fanning over his head. YHWH keystone written in Ancient Block Hebrew found in Newark, OH Indian Mounds. Welcome to the Location of the Oldest known TEN Commandments, the only place on Earth where the name of GOD is found having been written into a stone altar dedicated to Him, and the First place of worship established to the Biblical GOD in America! South of Albuquerque, and west of Los Lunas, New Mexico, an ancient inscription was carved into the face of a boulder centuries ago. It is the text of the Ten Commandments, written in Hebrew! Of particular interest is the fact that the type of Hebrew writing that was used was Paleo-Hebrew, which is the form of Hebrew writing that was used for approximately a one-thousand-year period, ending about 500 BC. This means that we can fairly conclude that the inscription of the Ten Commandments was engraved on the face of a boulder in New Mexico, North America, sometime prior to 500 BC! The Holy One of Israel led colonies of righteous Israelites to the land of America, prior to the destruction of Jerusalem and the Babylonian dispersion that occurred in about 587 BC. Harvard scholar Robert Pfeiffer. 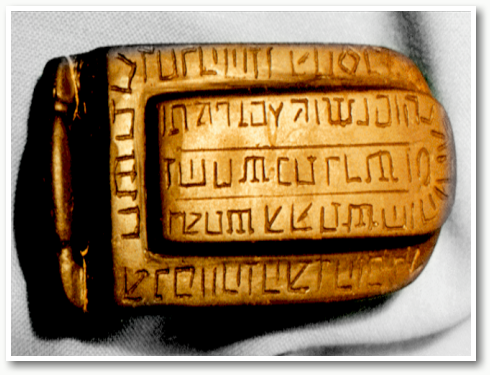 Pfeiffer, an expert in Semitic languages, concluded that the mysterious inscription was written in a form of Paleo-Hebrew and paraphrased the Ten Commandments. 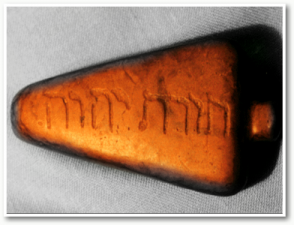 common during the time of king Solomon, the son of David, during Israel’s “golden age.” Solomon’s incredible wealth also strongly points to the Las Lunas stone inscription as having been carved during his reign. Financing sailing voyages of discovery and maritime trade is no small feat. Vast sums and investments are required. Solomon was the wealthiest king who ever lived, and undoubtedly had the resources to fund such far reaching and dangerous voyages. Also, during his reign Israel was in league with the other major world powers of the day, including Tyre and the Phoenicians, and the nation of Egypt. It is ‘Hidden Mountain’ (5507’) in New Mexico having the local “Mystery Stone” as it is still called by the State, now named the ‘Phoenician Inscription Rock’ on the official maps or “Mystery Rock” in their ‘area attractions’ lists. The site is located 35 air-miles due SW of Albuquerque on Hwy 6 (Historic ‘Route 66’) at mm18 S of I-40 or 16 miles W of I-25 at Los Lunas (where for it has also become known as the “Los Lunas Decalogue”). It was once an Israelite Wilderness Tabernacle site some 2500 or more years ago, with its high place Altar inscription to ‘the LORD our God’ of the Bible, and 80 ton boulder “Commandments stone” Mezuzah ‘at the gate’ -dating from the ‘Old Testament’ period of the Paleo-Hebrew ‘mother script’. It is the only ’10 commandments’ yet found in the ancient writing. Historically the mountain was called Cerro Los Moqujino (Cliff of the Strange writings) by the Native Americans stating it pre-existed the arrival of their ancestors into the area. It’s been said there exists about 2,000 glyphs around Hidden Mtn. for a radius of about 6 miles. The next most significant locale Hebrew is not far away (in the Purgatoire River valley due South of La Junta Colorado), where the oldest written inscriptions in the US are (c.1250 BCE. conservatively), from the earliest Ligature phase of word-formation by ‘tying letters together into a picture’. Those too have YaH inscriptions identifiable with the Exodus people. The actual massive rock which appears like a small ship with cleared keel (maybe what attracted his attention to it), of the volcanic basalt from the top Tertiary shelf is a remnant of geological prehistory which fell 2/3 of the way down the mountain to become what now has stood ground 2500+ years as a massive “Mezuzah” (Bible script found at every Jewish doorway). Set at a Right angle to the Left of the main entry before a natural gateway to this ancient site with Altar having the same writing but at exactly the opposite angle Leftward unto facing the River where it’s flowing in a strait line perfectly perpendicular to it. There are a surprising number of evidences and corroborations that there have been Israelites visiting and living upon the American continents for thousands of years. Other inscriptions, also written in Paleo-Hebrew, have been discovered in the states of Iowa, Ohio, and Tennessee, as well as in Brazil. In Newark, Ohio, a carved stone of curious workmanship was discovered which also bears an engraved inscription of the Ten Commandments of the Covenant – in Paleo-Hebrew. At a site known as Bat Creek cave, in Tennessee, an ancient Hebrew inscription has been found which mentions the Israelite tribe of Judah! Another fascinating archaeological discovery in America is an ancient artifact bearing an old Hebrew inscription of the Ten Commandments unearthed in Ohio in 1860. The tablet also includes a scene of an individual – Moses – carved into the front of the tablet in considerable detail, holding the tablets of the Ten Commandments. This artifact was discovered in an ancient burial mound. Without a doubt, these various inscriptions firmly establish the fact that Israelites were in America long before the arrival of Europeans!